흑칠 바탕에 금가루를 사용하여 그린 흑탱화로, 「화엄경(華嚴經)」의 칠처구회(七處九會)의 내용을 그린 변상도로, 「80화엄경」의 복잡한 내용을 천상을 의미하는 상단과 지상을 의미하는 중·하단의 3단으로 나누어 간단하게 묘사하고 있다. 하단에는 새롭게 천수관음(千手觀音)과 준제관음(准提觀音) 및 업경대(業鏡臺)를 배치하여 도상의 변화를 보여주고 있다. 통도사 화엄탱은 비록 그림 일부의 훼손이 있기는 하지만 각 장면을 표기해 놓아 전반적인 도상의 이해에는 별 지장이 없으며, 필력이 매우 치밀하고 섬세하여 수작으로 평가된다. 또한 19세기에 조성된 것으로 시기가 뒤떨어지긴 하나 예가 그리 많지 않은 것 중의 하나이며, 새로운 도상을 보여주는 자료로서 가치가 있다. This piece was made using gold powder on black background. 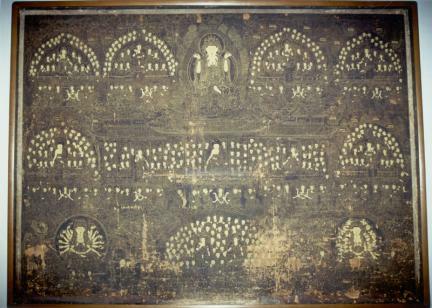 As a painting about nine sermon sessions at seven places appearing in Avatamsaka Sutra, it shows a simplified image of 80 sheets of Avatamsaka Sutra paintings in a piece composed of 3 tiers, with the upper part indicating Heaven and the middle and lower parts indicating Earth. The bottom displays the Thousand-Hand Avalokitesvara, Cundi Avalokitesvara, and Karma Mirror Stand. According to the relevant records, the piece was made by a group of monk painters including Cheonsu in 1811 (the 11th year of King Sunjo’s reign). Part of the piece was damaged, but there is no problem in understanding the images since each scene contains the relevant remarks. The brush strokes display exquisiteness. It is a unique one among paintings of its kind, making it a valuable material for those studying Buddhist paintings.